For the first time ever, The Real Mary King’s Close, is to launch ‘Close Fest’, a week long programme of underground events that promise to be as unique as the attraction itself. The festival that runs from 31st October until 9th November is to feature the best in local talent and will offer audiences the chance to experience one of Edinburgh’s best loved visitor attractions in a whole new light. 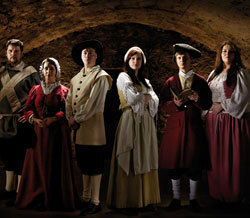 The Close Fest programme will include events ranging from murderous make-up, quirky comedy and spine tingling theatre to melancholy music and murder mystery, and marks the tenth anniversary since the warren of streets that make up The Real Mary King’s Close opened as a visitor attraction. Full details are on the website with booking recommended by calling 0845 070 6244 or going online. A short synopsis of events is listed below. The Close Fest programme will launch on the spookiest night of the year with The Dark Truth Tour, back by popular demand following its Edinburgh Festival Fringe sell-out debut. Not for the faint hearted, this interactive tour will give a tongue in cheek account of Edinburgh’s murky past as it delves deeper than ever before into plague and pestilence and murder most horrid. Murderous Make-Up for an hour long guided workshop allowing guests to create their own look from rupturing boils, bleeding blisters to ghoulish ghostly complexions. The workshop is a great pre-cursor to a spooky party or equally good as a stand-alone night out with the option to add on a tour of The Real Mary King’s Close. Halloween weekend will culminate with Burke, The Play, a haunting psychological drama about Edinburgh’s notorious serial killer, William Burke. Audiences will join William Burke in this underground setting, in his final hours before execution. Full of twists and turns, this fascinating performance will challenge the common perception about who the main protagonist was in the deadly partnership between William Burke and William Hare. Younger audiences will have the chance to travel in time with Crow Boy author Philip Caveney as he reveals the book’s connection with The Real Mary King’s Close. As well as an author Q&A, guests will be the first to hear an expert from Philip’s brand new sequel to Crow Boy, Seventeen Coffins, due to launch Spring 2014. Further into the week and fresh from a major award nomination for best cabaret show at the Edinburgh Festival Fringe, Mr Twonkey, aka Paul Vickers, brings his acclaimed show to the Close for this last ever Edinburgh performance of the full show. Bizarre, random, enchanting and nothing short of imaginative, a perfect mid week pick me up. A great precursor to the weekend and for one night only, Edinburgh’s underground streets that once echoed with the calls of market traders will be filled with the warm and emotive sound of Edinburgh based indie-folk four piece, Shooting Stansfield. Building on performances across Edinburgh and Glasgow, this gig presents an un-missable chance to see this highly applauded up and coming act in an intimate setting, catch them here before they really hit the big time. Rounding off Close Fest is the attraction’s first ever Murder Mystery Evening which will transport guests back to 1943 as they join the Lord Provost for a VIP party in honour of one of Edinburgh’s greatest heroes. As the party is abruptly interrupted by the air raid siren, guests will find themselves ushered into the underground shelter soon to become the scene of a most hideous crime, leaving them to question who would do such a thing and why?